This property is now constructed, fully landscaped and ready for possession. \rSomething for everyone! Custom built 2 storey home with detached shop for Dad, gourmet kitchen for Mom and pool for the kids. 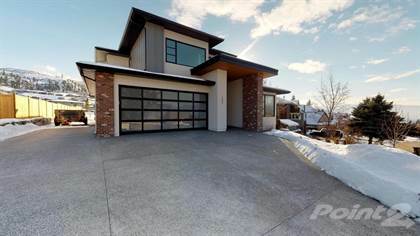 Situated on a 64' X 210' lot this modern contemporary 6 bedroom home features 4000 finished square feet on 3 levels plus a 950 sf detached shop. Main floor features include a bright and spacious great room with nano doors to the covered patio, pool area and outdoor kitchen. Kitchen features include 4 X 10 granite island, side by side stainless fridge and freezer, oversized gas range, prep counter and butler's pantry. Other main floor features include gas f/p, hardwood flooring, 9ft ceilings, den/bedroom, easy access pool laundry and bath and oversized double attached garage. The upper level features generous master, with walk-in shower, soaker tub, dual vanities, massive walk-in closet and views of Okanagan Lake. As well there are 2 other other bedrooms, bath and main laundry. The lower level features a spacious rec room, bathroom, 2 more bedrooms and storage. The lower level has an exterior entrance and is roughed in for a 1 bedroom suite. This flat lot has plenty of room for extra parking that would accommodate an "A" class RV and a boat as well as easy access to the detached garage. Hi, I'd like to find out more information about 357 Tanager Drive. Thanks so much!